Kaffir lime leaf adds an unmistakable, refereshing taste that is essential in many Thai soups & curries. The combination of lemongrass and lime leaf is a fantastic blast of flavor. The leaves have a strong fragrance and flavor that can not really be substituted. To experience the wonderful aroma, sliver the leaves with a knife or scissors and you'll begin to understand just how wonderful this plant is. A digestive aid with many known health benefits, the leaves cleanse the blood while helping maintain healthy teeth and gums. 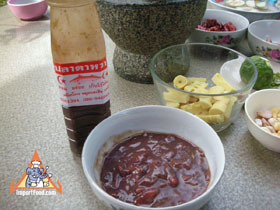 In Thailand the leaves are added to shampoo (said to prevent hair loss) and used as deodorant. Kaffir lime leaves grow in doubles. Sizes vary, but the average individual leaf is approx 2" long. Harvesting is done by hand and it's difficult because the branches have long thorns, so they tend to be expensive and not easily found in supermarkets. They freeze very well-just place in a ziplock bag & they'll retain their flavor for months. No need to defrost, just use as normal. Celebrity chef Martin Yan and cooking magazine Bon Appetit recommend buying kaffir lime leaves from ImportFood.com, so does Thomas Keller (French Laundry), Mark Bittman (New York Times). Martha Stewart's Body & Soul Magazine recommends as a spa treatment. We also offer the less-commonly used whole kaffir lime fruit. We ship fresh kaffir lime leaves via Priority Mail, quick delivery within 2-3 days straight to your mailbox however they are sent only at the beginning of the week because they are coming from Mother Nature (sometimes harvest schedules dictate short delays as well). Please Note: if you order only lime leaves, select "$0.00" as shipping charge at checkout (because the prices below include shipping). If you order lime leaves and any other items, you must checkout with "Fedex Ground" as the shipping method, and you will receive the other items separately. Any questions please feel free to call toll free 888-618-THAI. Lime leaves freeze well, so you can buy once and have enough on hand to last for months. We also offer Wholesale Pricing on Leaves, and Kaffir Lime Leaf Powder which is quite useful, and whole kaffir limes. Prices above include 2 day shipping. Thai Ginger Chicken Soup, "Tom Khing Gai"
Penang Chicken Curry, "Penang Gai"
Lemon grass Chicken, "Gai Sai Takrai"
Spicy Thai Corn Cakes, "Todman Khao Phot"
Pumpkin in Coconut Soup with Shrimp, Phaktong Tom Kati"
Below are testimonials received from customers about our fresh kaffir lime leaves. "I just wanted to take the time to tell you we have enjoyed your products. My mother-in law sent us some Kaffir lime leaves, from your company, after we told her we were having a hard time trying to find the leaves fresh. When they arrived the leaves were in amazing condition and smelled wonderful. We use them to make Tom Yum soup....it made the soup fabulous, I just ordered more, can't wait to recieve them in the mail. Thank you for having such wonderful fresh produce!" "I was amazed and delighted to receive the package of fresh galangal, Thai chiles, and Kaffir lime leaves within 24 hours of my order. This is a marvelous company, from which I have now just ordered everything to make my first grand Pad Thai, which is, I trust, only the beginning of many orders to come. Although we have many good Asian markets in the Seattle area, none offer the remarkable range of Thai products that ImportFood.com does." "Your selections are endless. You're the only place I can find kaffir lime leaves, out of season, that are fresh & wonderful! I give out your website to many specialty stores who can otherwise not meet the supply when demanded." "Another satisfied customer here... in 5 days received, as promised, dozens of FRESH aromatic Kefir lime leaves, just what my curries had been missing. I have already recommended your site to my friends. Thanks!" "Thanks so much for the kefir lime leaves...they arrived just as you promised. They are fresh and wonderful. It is such a pleasure dealing with you and your responsive company! I will be ordering again soon." "I stumbled across Importfood.com in my never ending quest for the best (and proper) ingredients for the curries (red, jungle, green) that I enjoy trying to make. I will definitely advise friends and family - they have heard me raving about your site since I purchased my own kaffir leaves (and some really nice-priced lemongrass) a couple of months ago." "The Kaffir leaves arrived yesterday. I found them last night. They still look and smell fresh and vibrant green. Many, many thanks." 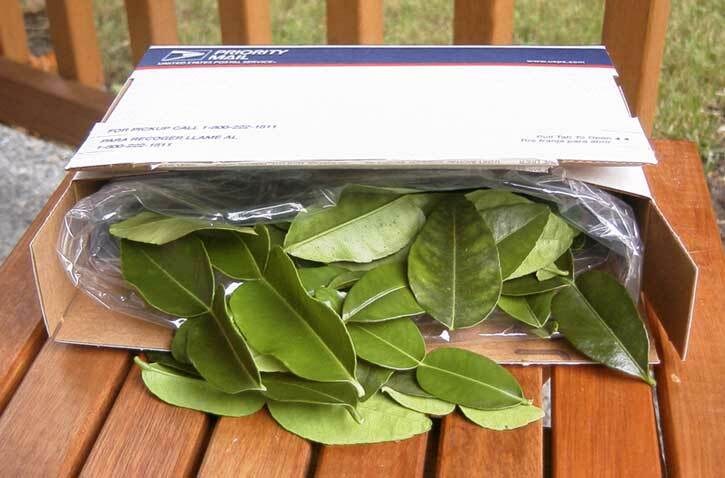 "I received the lime leaves in perfect condition yesterday- fresh, excellent quality, and extremely well-packed, not to mention quick shipping. Thanks! I will be back! " "Hi, I just received a shipment of Kaffir Lime leaves. They are beautiful and smell fantastic! I vacuum seal them and they are just as delicious the rest of they year as they are now. Thank you so much. "